Red Creeping Thyme is a low growing ground cover the will reach 1" to 2" in height and will spread from 12" to 18" in width. Blossoms will appear during the summer. The blossoms are reddish-pink fading to pink and will attract butterflies. Plant Red Creeping Thyme in full sun to partial sun and well drained soil. Plant Red Creeping Thyme in a Rock Garden, Miniature Garden, as ground cover, in between flagstones, or in containers. It also makes a great lawn substitute tolerating moderate foot traffic. Because of the fragrance, it is also deer resistant. 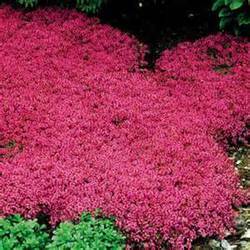 Red Creeping Thyme will become drought tolerant once it is established.